Previously, when you ran a report and wanted to include a filter, you could only include a filter for fields that were defined (single selection fields, or number fields), you could NOT search Text fields. Now you can search and set filters for text fields in the system. -Contains: will search the text and find matches for any partial matches e.g. if you type in Dr John it will return any searches that have a Dr John in them such as Dr Johns and Dr Johnson. -Equal To will search the text and find exact matches for the search term e.g. 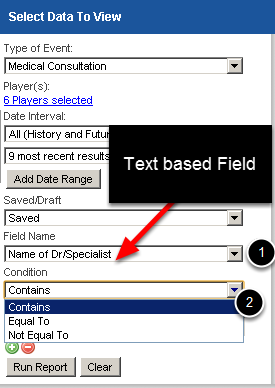 if you type in Dr John it will only return searches where only Dr John is in the text, not as part of a word (e.g. it will not return Dr Johnson). -Not Equal To will search the text for an exact match and will return all results that are not equal to this search e.g. if you type in Dr John, it will return all results when the Doctors name is NOT Dr John (e.g Dr Johns and Johnson will be returned, but a Dr John will not ). You can see that entries that include a Dr John have been found and are shown in the report. These included records for Dr Johnson and Dr Johns. You can save the Report, run a pdf report etc just the same as any other Report that you run. 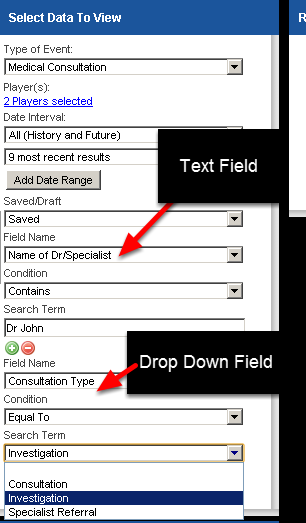 The example here shows that this report is set to find any records with the Text Field Name of the Dr contains Dr Johns and where the Single Selection Field Type of consultation is equal to "Investigation". You can set up different report filters depending on your requirements. Please note that Multiple Selection Box fields are not available for filters in reports yet.